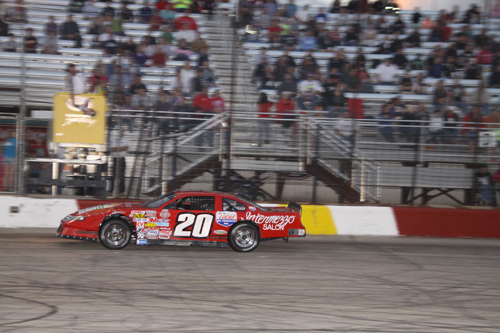 Steve Rubeck, Rockford, Illinois # 20 captures the checker flag in the Stanley Steemer NASCAR Late Models 30-lap main event of the evening. 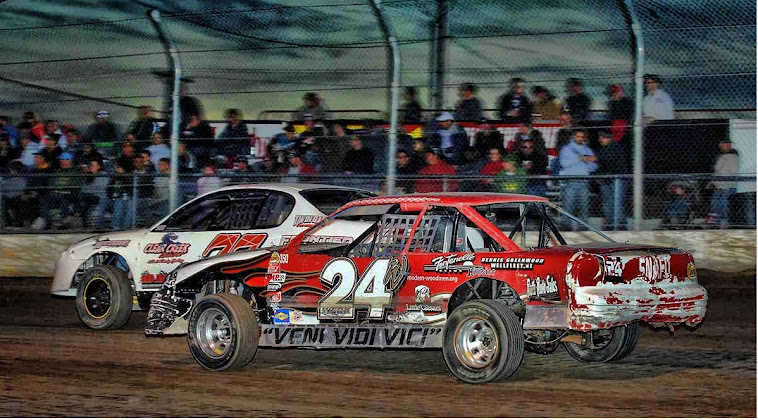 Dennis Smith Jr South Beloit, Illinois # 20 made a long week of hard work pay off in the Rockstar Energy Drink Roadrunner division, climbing from 20th starting spot to the front of the field in the division’s hotly-contested 20-lap main event. 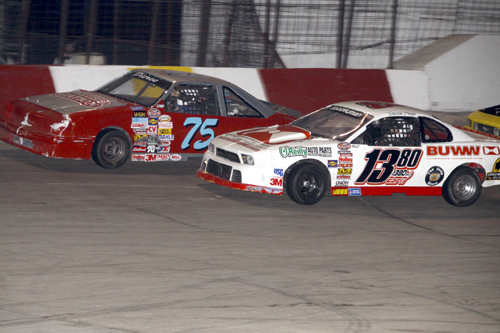 Jason Bragg # 1380 Machesney Park, Illinois races hard with # 75 Keith Pierce, Machesney Park, Illinois out of turn four. 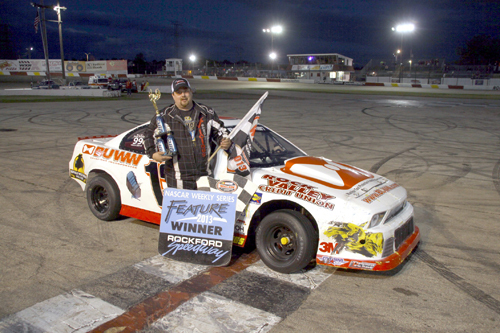 Jason Bragg # 1380 Machesney Park, Illinois a feature winner for the first time in two years in the Miller Lite American Short Trackers division. 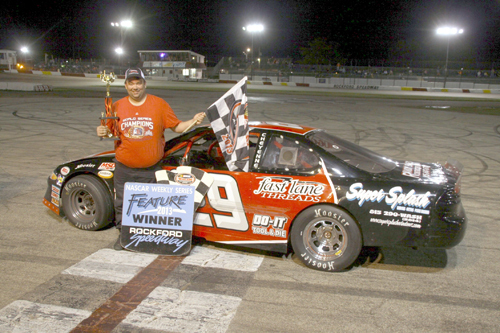 Brett McCoy’s # 29 Belvidere, Illinois night to shine as he powered his way to a victory in the Bargain Hunters Sportsman 25-lap feature. 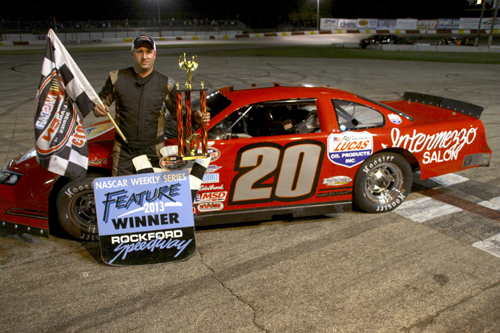 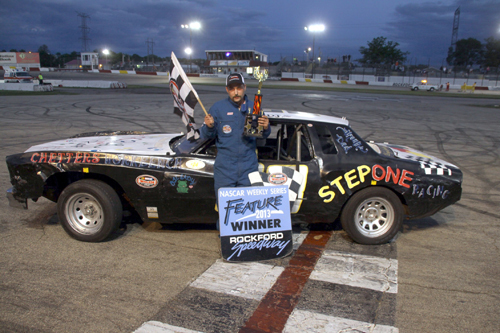 Steve Rubeck, #20 Rockford, Illinois, makes claim to feature trophy in the Stanley Steemer NASCAR Late Models 30-lap main event of the evening as he capitalized on a front row starting spot to win the Metro Medical Car Load Night at the Rockford Speedway. 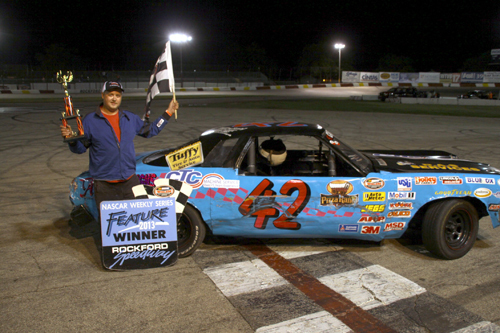 Adam Cartwright Belvidere, Illinois, # 42 started his season two-for-two in the Figure 8’s, “flat-footing” his way to the win.